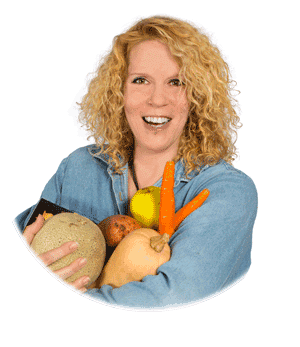 I’ve done it: I’ve just completed 62 consecutive days of Whole30®! I actually made this ice cream waaaaay back in June, before I even embarked on this great food challenge. Initially, I was supposed to be Whole30ing only for the month of July, so I figured I would hold on to the recipe until my efforts had ended. You see, I wanted to post nothing but Whole30® compliant recipes for the entire duration of my challenge. 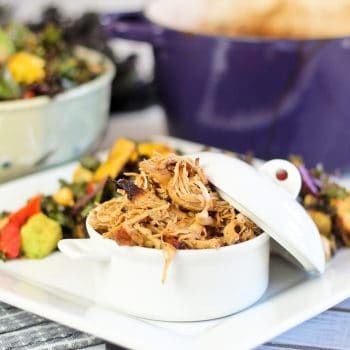 But then, as it was finally nearing its end, I sort of got talked into joining a bunch of people who were doing the official August Whole30® Challenge, so I decided to extend my good squeaky clean eating habits for another full month. And I do mean another FULL month. And as luck would have it, both July AND August have 31 days to them, which means I ended up stretching my adventure to a total of 62 days. Trust me, though, this wasn’t long enough a period of time to have me forget just how tasty and truly decadent this dessert was! 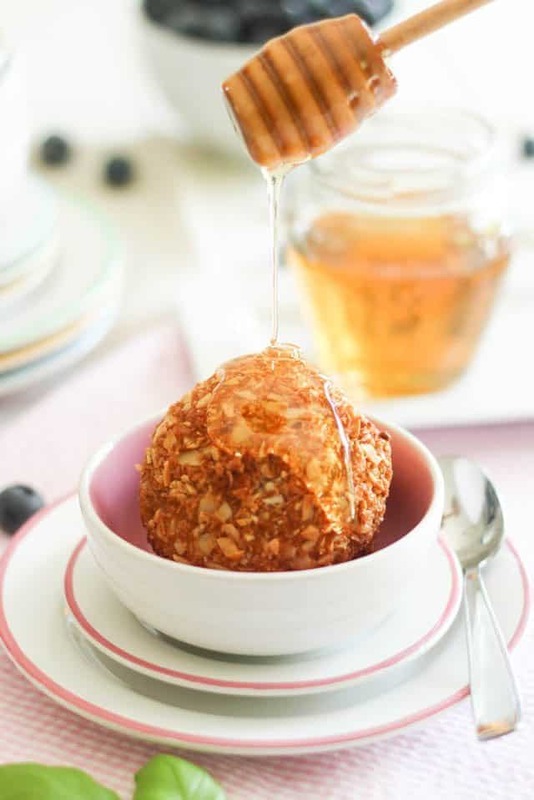 And the good thing is, since I haven’t been able to eat any for the past 2 months, I still have a few balls left in the freezer that are all ready to go and demand nothing more than to be plunged into a bath of hot oil and drizzled with beautiful, thick and sweet honey. That’s one of the best things about this dessert, I find. Initially, I have to admit that it’s fairly time consuming and labor intensive: you need to make the custard, let it rest for a full day, then churn the ice cream, turn it into individual balls, let those freeze solid then give them a perfectly round shape, freeze them again, coat them in frothy egg whites and shredded coconut and return to the freezer once again. 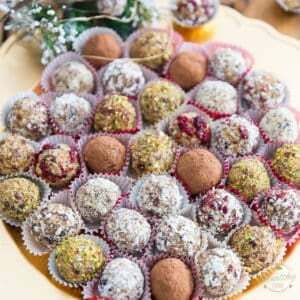 Once you get to this point, though, you can keep the balls in the freezer for an extended period of time, until you get a craving for a decadent treat or have a few guests to impress. 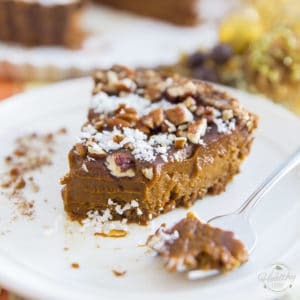 Then it only takes minutes to get this luscious dessert from freezer to fryer to table. I’m not gonna lie, making fried ice cream IS a lot of work. But it’s also insanely rewarding. 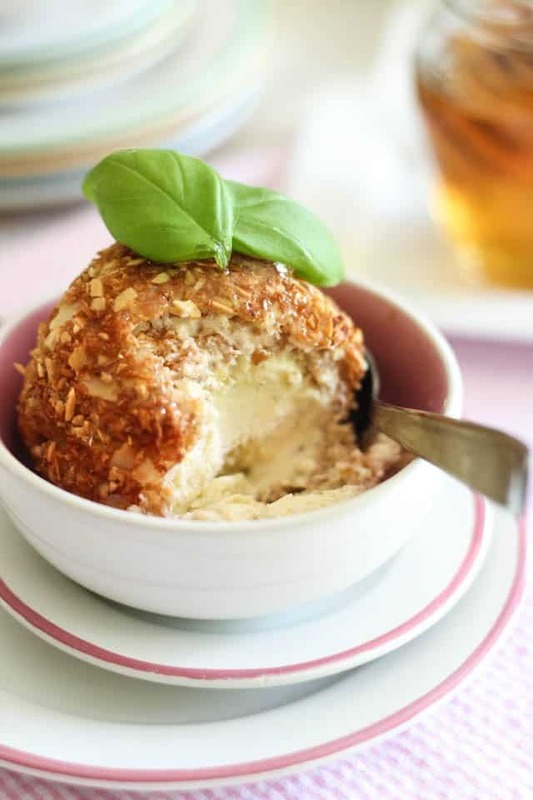 If you’ve never had fried ice cream before, trust me, you really, really have to give it a try. The sooner the better. Something definitely has to be said for ooey, gooey, soft, creamy, velvety smooth ICY COLD ice cream all trapped inside this very warm, intensely crispy and crunchy exterior. It’s a contrast in textures and temperatures that simply cannot be matched. But of course, no one says that you absolutely have to fry the ice cream, you know. You could very well serve this in its “unfried” state. 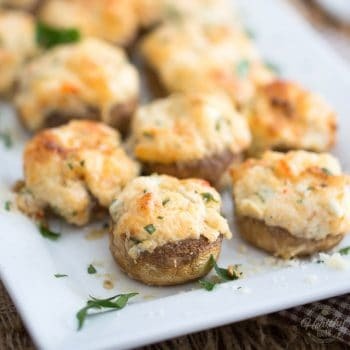 Just make sure you take the balls out of the freezer about 10-15 minutes before serving to give them a chance to soften up a bit. 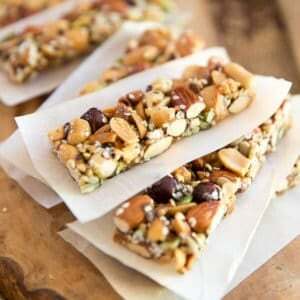 Or, you could even skip the coating altogether and serve it in its “naked” state. If you’re gonna do that, though, I recommend placing the freshly churned ice cream in the freezer to let it harden just a tad and serve it within a maximum of 4 hours of churning. Otherwise, it’ll get too hard and you won’t be able to scoop it. Whichever way you choose to serve this, I’m sure this creamy, velvety Toasted Coconut Ice Cream will not disappoint. In a medium saucepan, combine coconut milk, honey, salt and vanilla seeds as well as the empty pods (we’ll fish them out later). Whisk until thoroughly combined. Bring to a soft boil over medium-low heat, stirring often. In the meantime, place the egg yolks in a large heat proof bowl that can also be used as a double boiler. Once the coconut milk mixture has come to a boil, pour it in a steady stream over the egg yolks while whisking constantly. It’s important that you do not stop whisking; otherwise you run the risk of cooking the yolks from the heat of the milk alone. Place this mixture over a double boiler and cook, stirring constantly, until it thickens and forms a smooth custard that coats the back of a spoon (about 10 to 15 minutes). If you are feeling comfortable, you can also do this directly in a saucepan over low heat, but remember: the custard mixture can never be allowed to simmer or boil, else the yolks will cook and curdle. It just needs to heat up until the temperature reaches about 175°F (80°C) and/or coats the back of a spoon. When the custard is ready, take it off the heat, place a fine mesh sieve over a large empty bowl and pour the custard right through to catch the empty vanilla pods and any other lumpy bits. Help the custard down with a rubber spatula and don’t forget to scrape the underside of the sieve! Add the toasted coconut butter and stir until well incorporated. 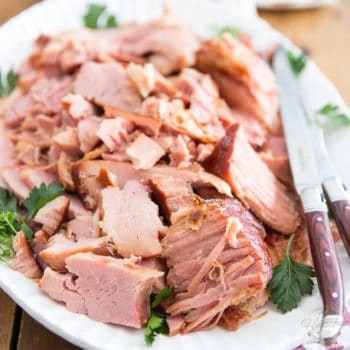 Refrigerate overnight, or for a minimum of 8 hours. Churn the ice cream according to the manufacturer’s instructions. In a food processor, add the shredded coconut, slivered almonds, salt and cinnamon and process into a “coarse-sand-like” mixture. Transfer that into a shallow bowl. 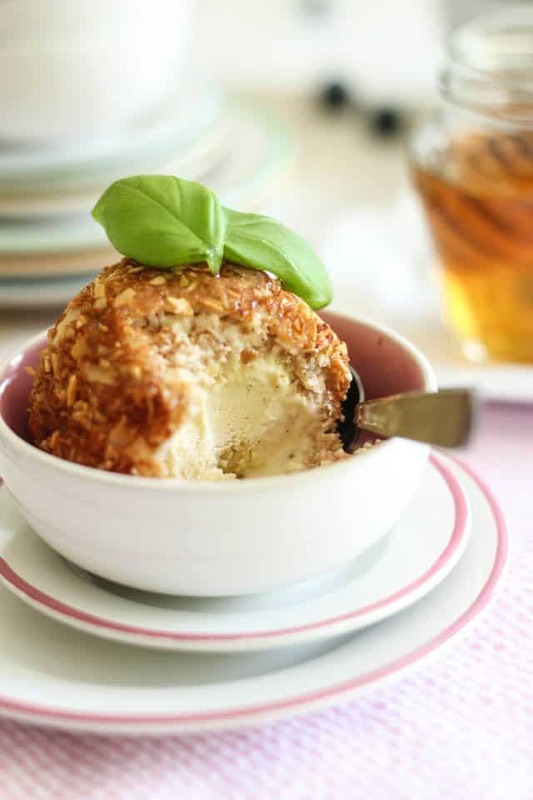 Take your ice cream balls out of the freezer and dump them, one at a time, into the coconut / almond mixture. 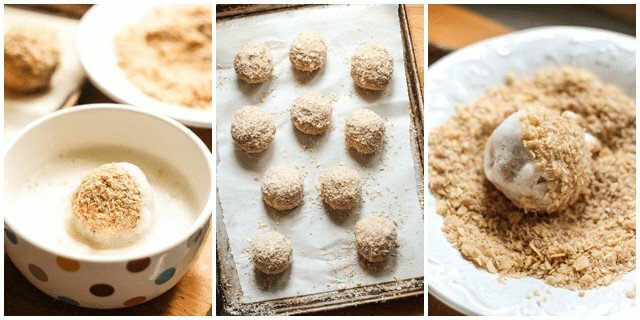 Cover them completely, and, working rather quickly again, press the mixture on the balls with your hands, forcing it to adhere to the ice cream and forming them into perfect spheres as you go. Put these back in the freezer until frozen solid once again. Hold on to whatever coconut / almond mixture you have left, you will need it for the final step. 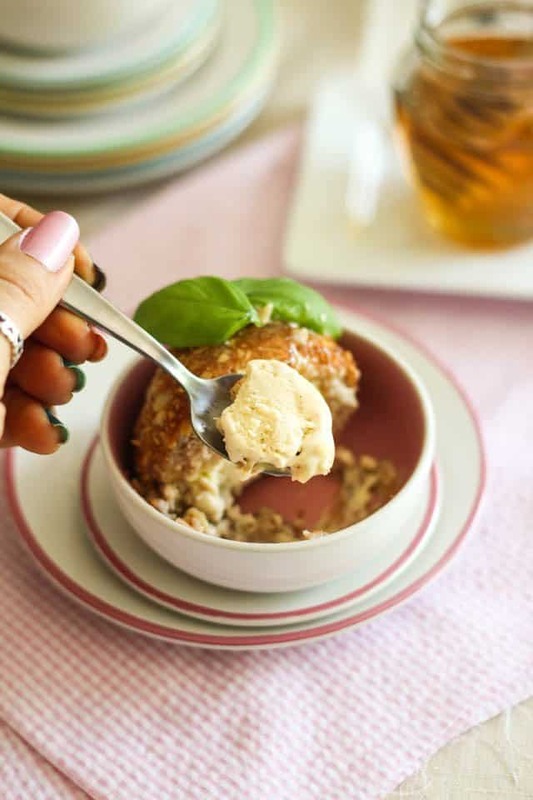 Once your ice cream balls have hardened once again, whisk the egg whites in a medium sized mixing bowl until thick and frothy. 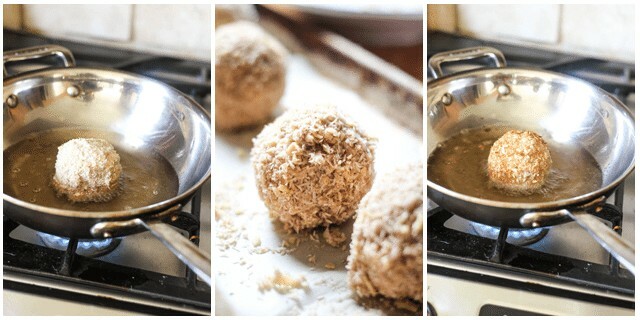 Quickly run each ice cream ball in the egg whites, then roll them in the leftover coconut / almond mixture. Place the finished balls back in the freezer and let them freeze solid one last time. Your ice cream is now ready to be fried and at this point, it can be kept in the freezer for several weeks, until craving strikes. When that happens, heat the coconut oil in a large saucepan or wok, until it registers 350°F on a candy thermometer. The more oil you use, the easier the frying process will be, but I’ve successfully fried my ice cream (one ball at a time) using as little as 1 cup of oil. Dump the balls one or two at a time (depending on how much oil you are using) and fry them until nice and golden brown all around, turning the balls as necessary. 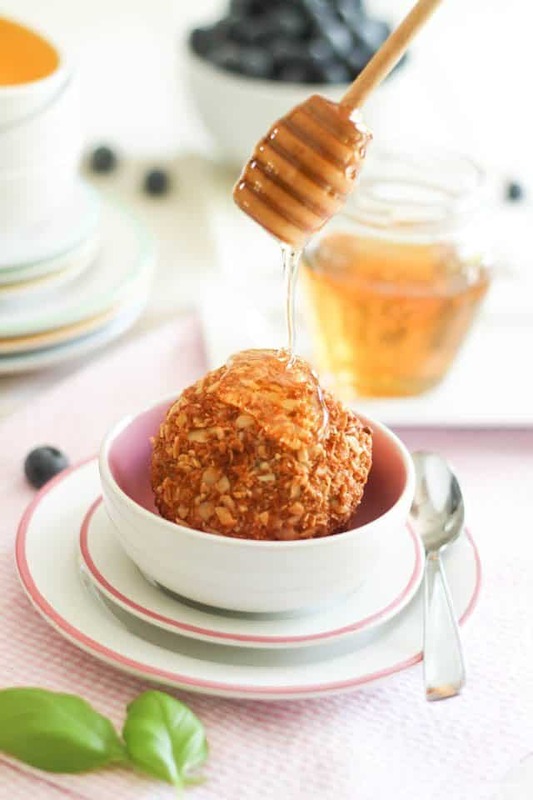 Serve immediately with a drizzle of honey. Custard goes into the churner, after resting for 24 hours in the refrigerator. As you can see, it’s already fairly thick at this point. 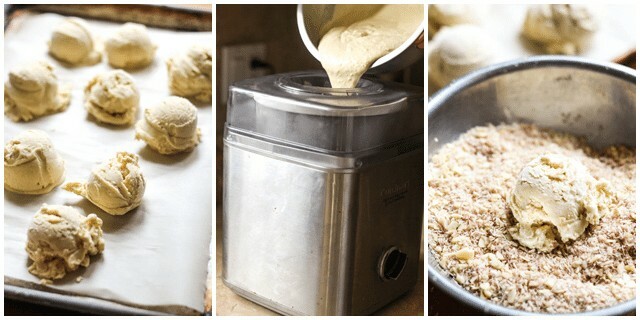 After churning, scoop your ice cream into individual balls and put them in the freezer until frozen solid. 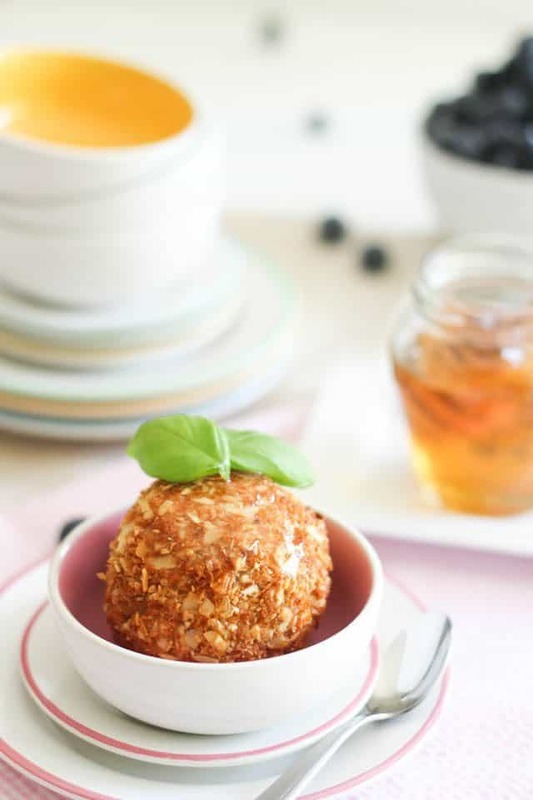 Shape your ice cream balls into perfect spheres by coating them with the coconut almond mixture and pressing them with your hands, much as you would a snowball. 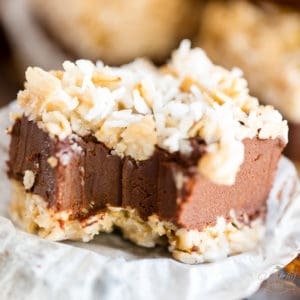 Give the ice cream a second coating by dredging them in frothy egg whites and rolling them once more in the shredded coconut and almonds mixture. At this point, you will want to freeze the ice cream balls until frozen real solid, or until ready to serve. 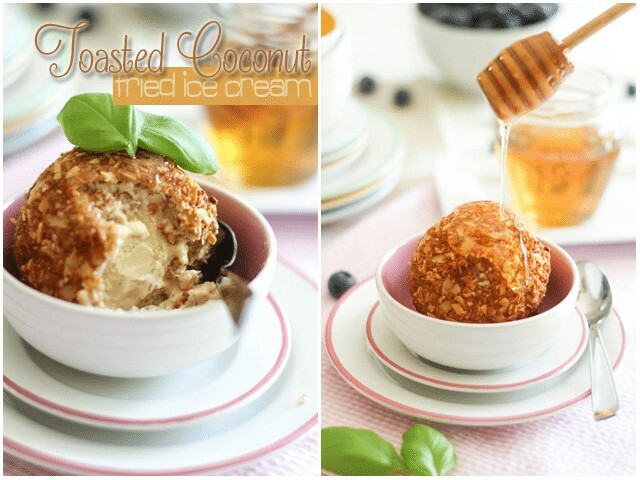 If only frying a couple of ice cream balls at a time, you won’t be requiring much coconut oil at all. Just make sure that you rotate your balls often so they get nice and golden on all sides. Garnish with mint leaves, or even fresh basil leaves, why not? Dig right in and prepare to be amazed blown away! 62 days in all! I totally did it! 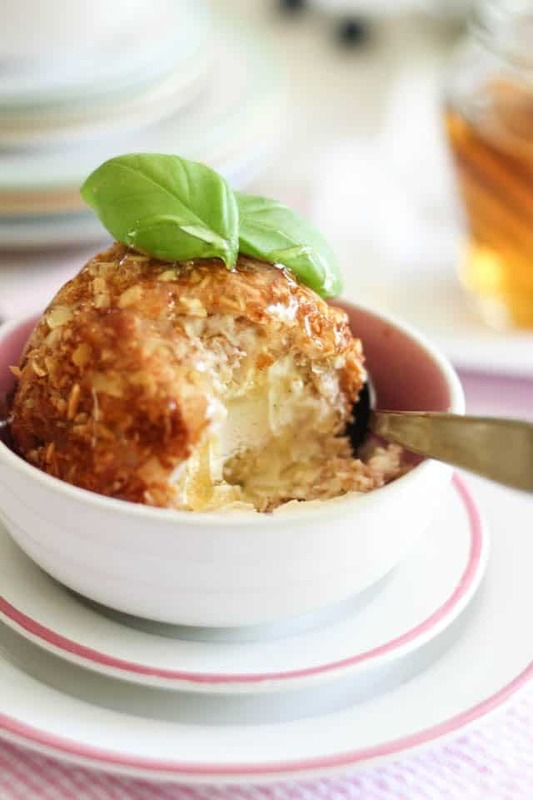 Woah, fried ice cream? Yes please. This recipe looks like a lot of work BUT it’s totally worth it. I mean look at that ice cream wrapped in a shell of toasted coconut. Too good to pass up!!! A Whole76? OMG, now that’s an awful long time. Mind you, after doing 62, I almost considered keeping at it for another month, but my severe itch to bake something good got the better of me. I’m a baker at heart, what can I say? 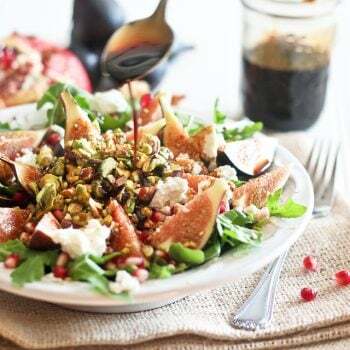 Best of luck to you with the clean eating as well as with the marathon. Running for 26 miles without stopping is no small task! Hats off, my dear. You have my total respect. OMGGG….how awesome does this look. I can have 5 scoops of those, what is not to love about it..everything’s too perfect and it’s fried. Amazing. I definitely want to give it a try! Congrats on finishing! I’ve only had fried ice cream once, but it was DELICIOUS! I need to try making my own. 14oz, Kitty. Hope the ice cream is to your liking! Let me know how it turns out!